Day 15: Fear: Friend or Foe? 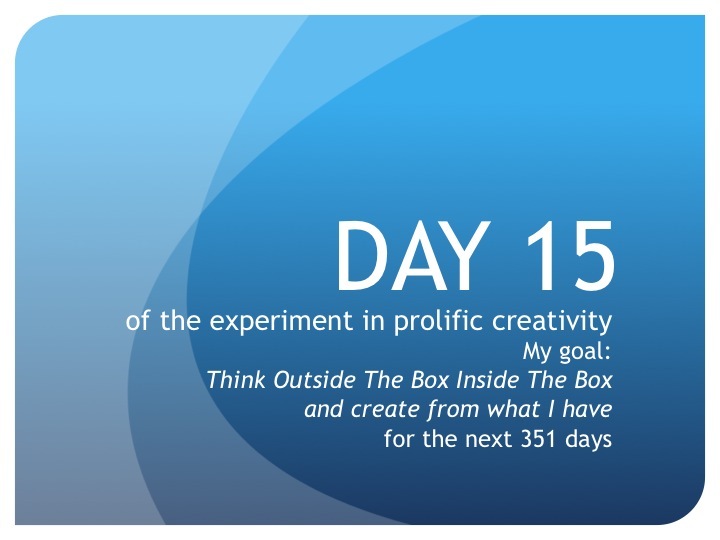 Day 15: I realize this experiment is being born out of the one place every artist or self-help guru or new age life coach tells you to let go of because it impedes the creative process: fear. According to dictionary.com fear is a noun defined as “a distressing emotion aroused by impending danger, evil, pain, etc., whether the threat is real or imagined; the feeling or condition of being afraid.” Real or imagined—how annoying. Death is real. My fear that the next-door neighbor is plotting my premature demise by purposely putting his trashcans right in front of my truck every Monday morning on garbage day blocking my path to the road is probably imaginary. Or is it? I’ll let you know what happens in the morning. I type “fear” into Google and 671,000,000 results come up. I type in “fear” in the search engine on Amazon.com and 65,349 listings come up. I know, I know, I’m supposed to stay 150 feet away from that site. It is for research only I brave the allure, no trees are killed or books ordered in the gathering of that intel. Fear, by definition, may just be a flighty feeling, an emotion, but it’s a popular one! Tomes have been written on the subject. I pull two books off my bookshelf with the word somewhere in the title, Art & Fear and Fearless Creating. I open Art & Fear to a dogeared page and read, “Fears arise when you look back, and they arise when you look ahead. 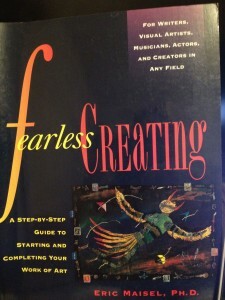 If you’re prone to disaster fantasies you may even find yourself caught in the middle, starring at your half-finished canvas and fearing both that you lack the ability to finish it, and that no one will understand it if you do.” I check Fearless Creating. It’s dogeared to this quote by Anna Held Audette, “What you have to do now is work. There’s no right way to start.” I don’t remember reading either of these books and instantly want to revisit them both. I am working on my application for the mentor program. My interview is Wednesday. I struggle with the statement of interest. Not that I don’t know why I am seeking a mentor but that I am constantly battling the breathtaking fear that pops up every couple of hours in the process. It’s not the good kind of fear either, the real kind, like a tiger or a bear padding into my room to attack me while I write about what it is I expect to gain from the program. No, this fear is the annoying kind, the kind that is from imagined dangers: asking for help, failing, embarrassing myself because I’m too damn old to apply for a mentor. It’s the fear you feel when you’re doing something you’ve never done before. It’s the fear you have before you take a leap. I’ve always attempted to live by the idea that “everything I want is on the other side of fear.” As in, get through it, process it, beat it, hide it, ignore it, let it go and you can manifest your wildest dreams. First of all, that hasn’t worked that great for me yet, and second of all, I can’t let it go. It’s too real, too palpable; too close. Too many friends, acquaintances, friends of friends and friends of friends of friends are sick, some die, way too soon. All are a shocking, daily reminder that I won’t be getting out of this life alive. As I type my answer to, “what are your career goals,” I decide to redefine how I use the fear that comes up. Instead of it slowing me down every time I feel it, I say, “It’s a signal, a catalyst to take action.” I make it a game. Like slamming a shot of espresso or chugging a can of Rock Star, I take off with a full head of steam with each jolt of fear. Career goals: check. What’s next? More fear? Excellent! I have more to write, more to do, more to create. Fear is not only a wake up call, a call to appreciate and experience life but now, fear is also another tool to add to my motivation arsenal—like speed only without having to take a pill. Everything I want is on the same side as fear. We’re on the same team now. I have a moment of clarity. I realize it’s what I do with my fear that really influences my life. Fear isn’t the real enemy, it’s fear’s by-products: stress, anxiety, insomnia, addiction, hiding, stopping, paralysis, heart attack. So, there is more to fear than fear itself! There’s terrorists, cellulite, childproof bottles and, of course, the final destination: pain, suffering and death. Writing an application for a mentor doesn’t measure up. I relax. I find my groove. I write my statement of interest. Will I end up getting into this program and getting a mentor? I hope so, but I don’t know. If I spend the entire year doing this experiment, will anything happen? Will nothing? Something? Everything? Yes. No. Maybe. Who knows? I don’t. And I won’t know what the outcome of my application or this experiment will be unless I actually do them. And that, I’m not afraid to admit, is Exorcist, Carrie and Saw combined style scary. But, unless I take one baby step and then another and then another, nothing is definitely going to happen. Failure is totally an option, and more than likely, failure is the probable outcome. Maybe even a definite outcome. But on the flip side of that, WHAT IF it’s not a total failure? What if even the briefest of victorious moments, like finishing my statement of interest and liking it, makes me happier for even 5 more minutes more than I might have been not doing anything? Even 5 happier, contented, satisfied, accomplished minutes a day sound good to me. If I do create something that I think is “good” work (and my mom and third cousin say is brilliant), will a larger, paying audience ever share in or experience my creation? Yet again, I hope so, but seriously, I have no clue. But, the really good thing is, nobody else knows whether something will be deemed brilliant or catch on with an audience and go on to make money and change lives either. To quote the amazing screenwriter William Goldman on Hollywood, “nobody knows anything.” So, at least we’re all starting on an even playing field. Is fear a friend or foe? I surrender. Fear is officially no longer a dirty word to me it’s my pal. What choice do I have? It won’t go away. I might as well learn to use it for good instead of evil, for propelling me forward instead of paralyzing me. To quote my favorite line in one of my favorite movies from one of my favorite characters from Shawshank Redemption, Andy Dufrane, “I guess it comes down to a simple choice really. Get busy living or get busy dying.” It’s time to get busy living and creating from what I have even though I’m scared shitless on a regular basis. Until tomorrow, create from what you have…including your fear—real or imagined. Kelli, would love to hear more about the mentoring program. Great post as always.